Do you want to repair Microsoft exchange file? So you can use Enstella Microsoft EDB to PST Software that smoothly removes all errors from EDB file and repair exchange EDB File. 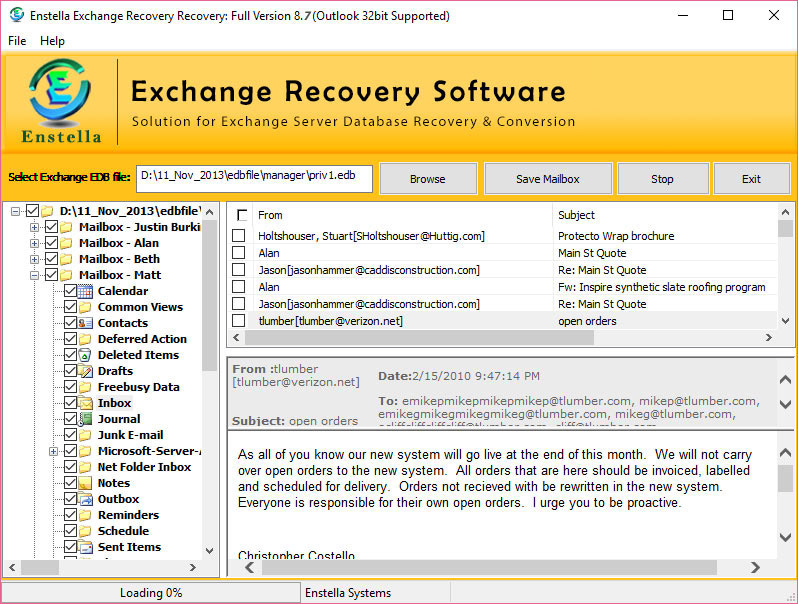 Through Microsoft EDB Recovery software you can smoothly recover exchange EDB file and move them into outlook file along with every email properties- to, cc, bcc, date, time or subjects etc. The remarkable Microsoft EDB to PST Converter Software makes you capable to convert exchange EDB File to PST file with full attachments- Inbox, Outbox, Sent Items, Deleted Items, Draft, Journals, Tasks, Calendars, Notes, and Contacts in few minutes. This tool let you open exchange EDB file into outlook file in safely manner. It works on EDB File version up to 2013. There are some features of Microsoft EDB to PST Software * It is the solution to fix all exchange corruption issues * Easily export single and multiple attachments into provided formats * Efficiently extract EDB emails between two dates-(to date-from date) * It works on exchange file version up to 2013 * Automatically find EDB file location per folder * Convert exchange EDB File into outlook file * With demo restore 25 EDB Emails into every format at free of cost but to restore more than 25 emails, you have to download full version of the software at USD 299. Changes: Enstella Microsoft EDB to PST Software-deeply scan EDB file and Convert EDB 2 PST File. SOFTWARE LICENSE AGREEMENT This Software License Agreement is a legal agreement between you (either an individual or a single ) and . for the Enstella Systems software product identified above, which includes computer software and may include associated media, printed materials, and "online" or electronic documentation ("SOFTWARE PRODUCT"). By installing, copying, or otherwise using the SOFTWARE PRODUCT, you agree to be bound by the terms of this AGREEMENT. If you do not agree to the terms of this AGREEMENT, do not install or use Enstella Systems SOFTWARE PRODUCTS; you may, however, return it to your place of purchase for a full refund. Enstella Systems SOFTWARE PRODUCT LICENSE: The SOFTWARE PRODUCT is protected by copyright laws and international copyright treaties, as well as other intellectual property laws and treaties. The SOFTWARE PRODUCT is licensed, not sold. 1	GRANT OF LICENSE. This AGREEMENT grants you the following rights: ·	Applications Software. You may install and use one copy of the SOFTWARE PRODUCT, or any prior version for the same operating system, on a single computer. The primary user of the computer on which the SOFTWARE PRODUCT is installed may make a second copy for his or her exclusive use on a portable computer. ·	License Pack. If you have acquired this AGREEMENT in a Enstella Systems License Pack, you may make the number of additional copies of the computer software portion of the SOFTWARE PRODUCT accordingly to the number of licenses acquired (stated in receipt), and you may use each copy in the manner specified above. You are also entitled to make a corresponding number of secondary copies for portable computer use as specified above. SOFTWARE LICENSE AGREEMENT This Software License Agreement is a legal agreement between you (either an individual or a single ) and . for the Enstella Systems software product identified above, which includes computer software and may include associated media, printed materials, and "online" or electronic documentation ("SOFTWARE PRODUCT").